I am thrilled to say that yesterday in the late afternoon I was able to submit Downstream to the 2016 QuiltCon QDAD Showcase! 1. You must be a QDAD member and a MQG member (no exceptions). 2. You may create up to 2 finished Modern quilts based on this spark. Use the photo and the color palette as inspiration. 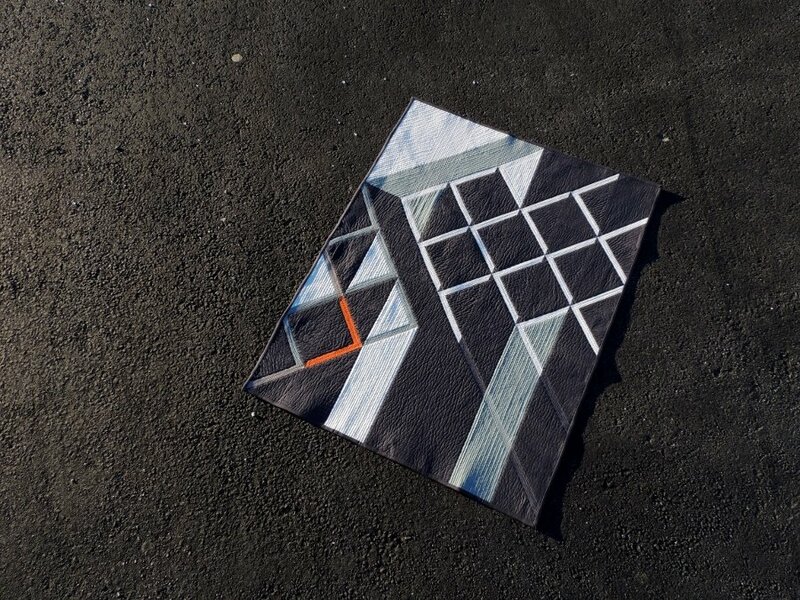 The exhibit will display quilts based on this spark of the New York High Line. 3. Designs must be original. Prints or solids can be used.You can submit any size of your choice but must not exceed maximum show measurements. 4. Deadline for entries is November 30, 2016 (the same as other QuiltCon quilt show entries). Quilts will be judged for exhibit entry by a MQG board member, a QDAD representative and a guest. The quilts will be exhibit only in the show. I was inspired by the left hand side of the spark image for the QDAD Showcase design challenge; I was struck by the the angles formed by the white and charcoal building and the bright orange sign which reads: “We live downstream from our stuff.” I based my design around sharp angles and the idea of influence and “downstream” relationships between elements in the quilt. I chose to paper piece the angles for precision, and I used dense straight line quilting to emphasize the “downstream” nature of the interaction between the design elements and their neighbors. Now… I never said I had “finished” the quilt. It will likely be done by mid day Wednesday at the absolute latest… but tomorrow is forecast to be cloudy / overcast all day. I had about 30 minutes of direct sunlight remaining yesterday after sewing the binding to the quilt top, so I taped it to the back! In fact, I have already done about 25% of the hand binding work but took a quick break to write this blog post before my husband gets home from work. I washed and blocked Downstream before trimming it square and putting on the binding. The quilt finished at 34″ wide by 43″ long (~5% shrinkage from the quilt top). For the quilting, I used 50wt Aurifil #2021 (Natural White) to match the Kona Snow, #2610 (Light Blue Grey) to match the Kona Shale, #2630 (Dark Pewter) to match the Kona Charcoal, and #2235 (Orange) to match the Kona Carrot. Backing is Kona Shale, Binding is Kona Shale, and batting is Quilter’s Dream Green. With this finish, I have 3 more quilts (one the size of the top of a Queen Size mattress after first wash and 2 mini quilts) that I would like to complete this year. How is your WIP list for the year going? 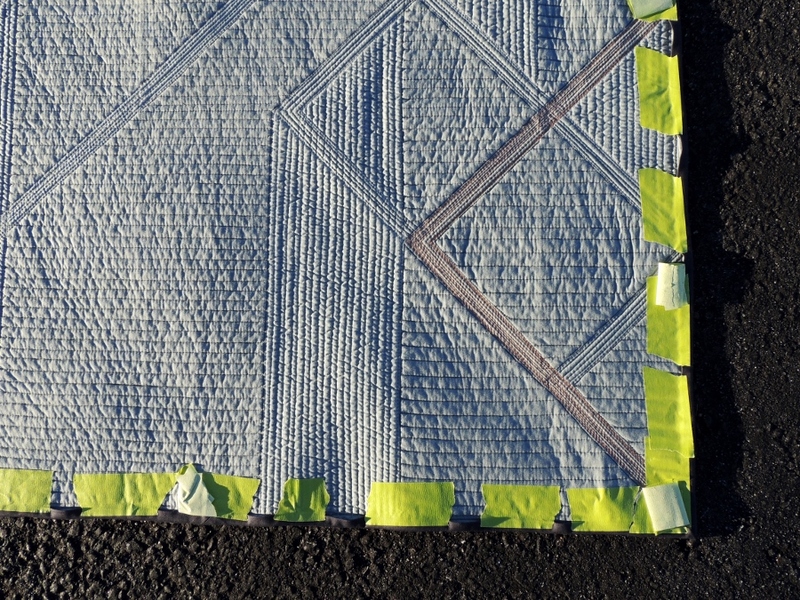 Have you ever used this binding trick or any other in order to meet a quilt deadline? Linking up with Let’s Bee Social and Finish It Friday. Congratulations on you clever and beautiful design!! Love that quilt! The quilting and the quilt amazing. In particular love the way you’ve extended the quilting lines – so effective. Once again your artistry astounds me–the aerospace industry’s loss is definitely the quilting community’s gain! That’s a great design, and I can definitely see the inspiration pic in your quilt. Congrats on making the deadline! This is really stunning and you nailed that showcase design spark…well done! Fabulous Yvonne, on your design and quilting! Once I attempted to do the tape trick, but it didn’t work out. So I stayed up to 2am to hand sew down the binding with 1/2 inch basting stitches and then had to go back resew after submission. But it worked out! Beautiful quilt Yvonne! The quilting is wonderful on it. I have glue basted the binding before and it worked, no one was the wiser. Stunning quilt! I hope I get to see it in person at QC! This design is amazing, one of my favorites you have made! I can see how the origins of the design were inspired by the photograph. Your quilting is wonderful! Ahh, the High Line was your inspiration. Now your quilt makes sense to me. On previous posts, I was trying to conjure a fish ladder, but it wasn’t working in my mind. 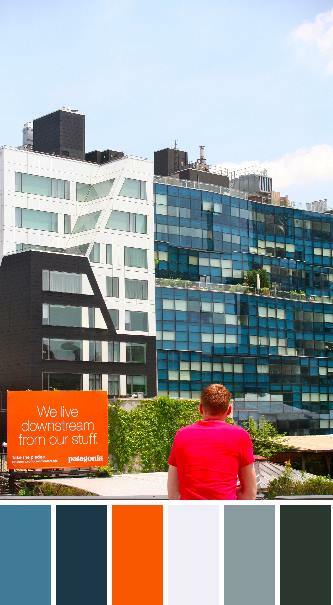 (I may have missed previous QDAD references to the inspiration picture…) I visited the High Line earlier this year, and loved it. Beautiful job of interpreting a lovely spot. (Sonic) boom!!! You are the winner! Hands down. Judging over. Your designs are amazing. I cam see where you derived your design and inspiration, yet you achieved so much more–astounding! Congrats on the finish!! A wonderful take away from the Spark! First, this design is amazing! You have such a great eye for design! The quilting in the perfect compliment…perfect! I love your tape trick for the binding. Sometimes you gotta do what you gotta do for photos! Another beautiful quilt. You have such a knack to translate your vision to fabric. I enjoy watching your journey. Very cool design~I like the “mechanical precision” of your designs. They are very structured and I can see a lot of thought going into them. Hoping it gets into the show! Downstream has the sparks flying. Your design and quilting are amazing! Good Morning Yvonne! You have awakened your quilting destiny once again! 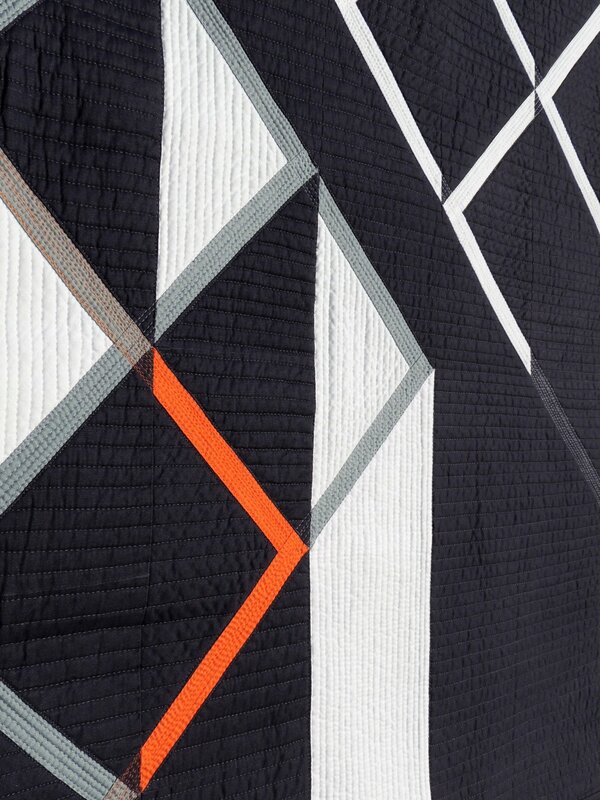 The entire quilt from fabric, design to quilting is fantisimo…just knock out gorgeous! Congratulations on another supreme winner! Thanks for also inspiring me once again also! Have a fantastic creative day! I love this quilt Yvonne, so dramatic, such contrast. I honestly think its one of your best, or at least it is in my opinion. Another beautiful quilt!!! I really like the little bit of orange in it. Did the edgers of your quilt fray after you washed it without the binding? 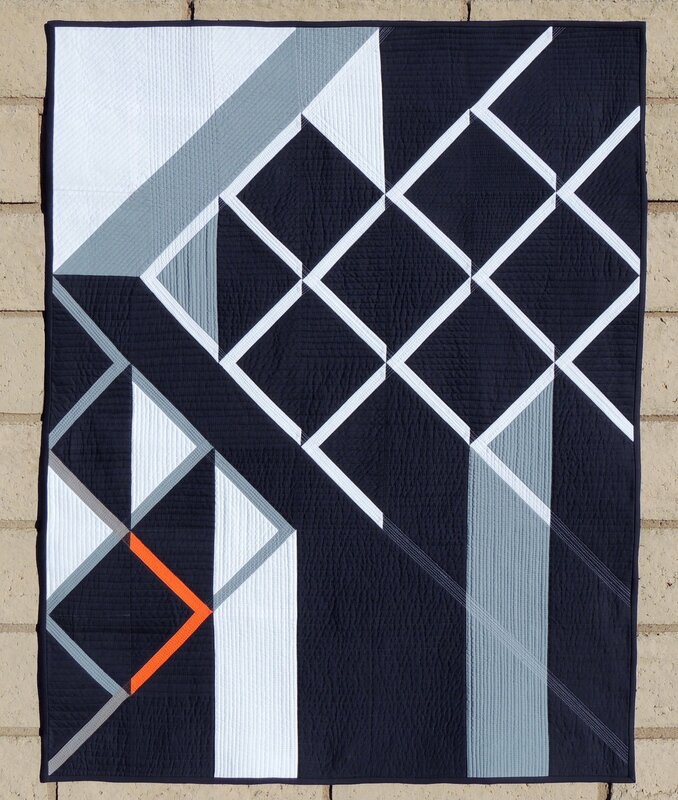 Such a striking quilt. Love the dash of orange. Love love love this! Hope you write a pattern for it. I know exactly who I would make it for. I wonder if that firm would like your quilt for their advertisement!!! Stunning, what a precise pattern. Binding with tape for a photo shoot, I haven’t done that but I do know of a lady who use double sided tape to hem trousers when she ran out of time to machine them!!! And NO, it wasn’t me. Yvonne, it’s wonderful. I love how it’s very YOU (reminiscent of your Beacon quilt) while still encapsulating the prompt. I hope to see it in person at QuiltCon! It’s stunning Yvonne and I hope to see it in person as well. I think you need to do a post about washing and blocking before trimming……..when you have time. Good luck with your other finishes. Already commented on Instagram, but was happy to see this blog post with more details. I love this quilt. I am sure it will be chosen for the exhibit because you captured the idea of the “design spark” so perfectly. I really love how the quilting carries the idea of the quilt as well. You have a sure winner! This is really wonderful. Your quilting just took it over the top! Good luck! Thank you for sharing your quilt. It is beautiful and the quilting is so complimentary to the design. (Love the tape trick!!) The little blast of orange keeps this from being stark. Good luck in the show. It looks fantastic! I loved seeing your inspiration photo with the quilt. And the tape on back is really awesome. Looking good! Neat design! I made a bag and I still have the inside gap for turning open :)) It’s my fav bag and I use it for like 2 years that way. I love your interpretation of the photo. You did a great job. Good luck. Absolutely awesome! It is so striking in its simplicity and line! Congrats! I thought I loved Beacon, but now I love Downstream even more Yvonne. It is awesome! I love how graphic it is. This is just gorgeous Yvonne! I can see the spark in your design – and your quilting is just crazy good! Good luck! Oooh I love that first photo! The angle and black background are unusual, but perfect for this quilt. Your quilting and thread color choices work so well with the piecing! This is so good Yvonne!!! Love the design you came up with. WOW – so beautiful as usual. thanks.